Art and food – what a great combo. 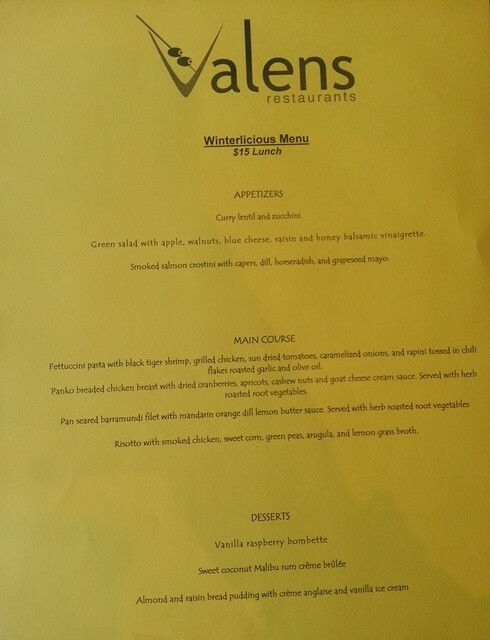 After taking in the enjoyable The Great Upheaval, Guggenheim Collection at the AGO, my friends and I made our way over to Valens Restaurant participating in this year’s Winterlicious 2014. Oh, It ends tomorrow so hurry if you haven’t been yet! What a cozy little joint! When we first arrived, every table was occupied as people we finishing up their lunch. It smelled SO good in there, that we didn’t mind waiting a few minutes. I had time to take in the paintings of celebrities that adorned the walls, and the cute bar at the back that led to the kitchen. The single-occupant (one Male, one Female) washrooms were located downstairs. We had the most likeable waiter I have encountered in a long time; I wish I had gotten his name to give a shout out. He was apologetic about the wait (which really wasn’t that long) and enthusiastic about meeting all our needs. He answered all questions, cracked jokes and brought everything nice and hot to the table. He even popped by to say goodbye before his shift ended. The good part – let’s get right down to business! I must add that we were REALLY impressed with the portion sizes, considering that it was Winterlicious. Let’s face it, some restaurants usually serve smaller portion sizes but this was surely not the case at Valens. We were s-t-u-f-f-e-d at the end. Thank you to Mel, Sid, Jessica and Yuna for bearing with me as I harassed them for pictures before they could dig in! My friend Mel and I went off the Winterlicious menu grid and ordered an extra appetizer because… well…. 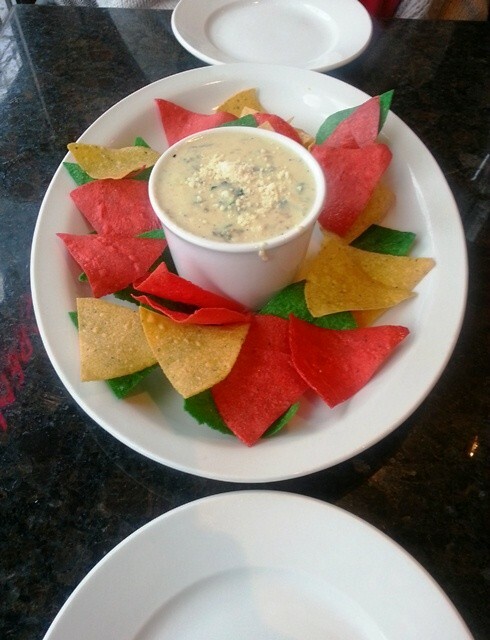 it was LOBSTER DIP (Lobster, spinach and artichoke dip served with corn tortillas). Say no more, just get in my belly! It was delicious. There were actually bits of lobster mixed in with the spinach and artichoke topped with a dusting of parmesan. We later found out that the chips are made fresh after we ordered some more to finish off the dip and they took a bit longer. And now onto our winterlicious orders! Mel and I both had the Smoked salmon crostini with capers, dill, horseradish and grapeseed mayo. You really have to be a fan of horseradish’s very distinct flavour to enjoy this dish. I loooove me some salmon (in any form), and actually appreciated that pungent taste of horseradish fused with the smoked salmon taste. The capers also have a very distinct flavour, so if you like those you’d definitely like this dish. OH. MY. DELICIOUS. I was sold when I saw “goat cheese cream sauce” but wasn’t sure how it would taste with the fruits. Can I just say that the tartness of the sauce mixed with the sweetness of the fruits made my life?! The chicken was nice and juicy and was a nice pairing with the vegetables which were roasted to perfection (not too mushy). Mel kept taking bites of my chicken and I must say our friendship was almost on the line. Like…. I can’t even…. Let’s just move on because I’m starting to want more RIGHT now. I highly recommend this dish. It was her first time having risotto and did enjoy it. There was a spice that we couldn’t quite name that she wished there was less of, but it was an overall good first time experience with risotto. I tried a bit, and though not usually a risotto fan, I liked it! I especially enjoy sweet corn and peas, so that really helped. She thought her dish was flavourful and the fish was juicy. She really enjoyed her meal. She liked it, although she didn’t think there would be that much sauce (due to the oil) which had all settled at the bottom. She liked it but was so stuffed at this point that she didn’t finish it all! The majority of the table ordered Sweet coconut Malibu rum crème brûlée, and I’m sure I don’t have to explain why. How was it, you ask? Well….. a picture is worth a thousand words, right? Since it was A Winterlicious lunch, the value was $15 (plus tax and tip), and that was a LOT of food for that price. We looked at their regular menu and the prices were comparable and affordable. The lobster dip was $10. I enjoyed *every*single*morsel* of food I consumed at Valens Restaurant and would definitely return. 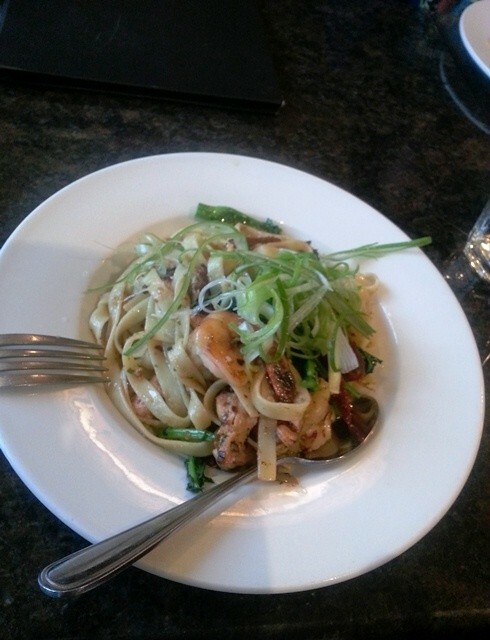 I liked the casual atmosphere, great service and wonderful food. It is also in a great location with tons to do around… including visit the AGO! Valens Restaurant is located at 19 Baldwin St, (416) 340-0303. “Licious” time is always the best opportunity to try out new restaurants. This one is definitely a fave!